Yesterday afternoon, the Blue Jays played a Spring Training game against the Orioles in Sarasota, Florida. Now, normally, Spring Training games aren’t much more than a chance to watch baseball again, but this game was different. Not only did we get another look at Aaron Sanchez, (and his finger) but we saw two of the Blue Jays' super-prospects, Vladimir Guerrero Jr. and Bo Bichette make their Major League Spring Training debuts. It would’ve been cool enough to see these two kids out there for the first time no matter how they performed, but they didn’t care for that notion, as they went a combined 6 for 8 at the plate. Guerrero Jr. went 4-for-5, while scoring a pair of runs, and Bichette went 2 for 3, while scoring a run and driving in 2. In addition to the performance of those two guys, Anthony Alford - another top Blue Jays prospect - went 3 for 4 in the game, while scoring 3 runs and driving in 1. Now, it’s probably too late to say this, but we as fans shouldn’t overreact. It’s definitely promising to see these kids succeed, but we can’t expect this from them in every game; not mention the fact that Bichette is still only 20 years old, while Guerrero Jr. is only 18 (believe it or not.) There is still a lot of time for these guys to grow as players and professionals, and even though I don’t see them in the majors anytime soon, I do see this as a possibility for Anthony Alford sooner rather than later. If the Blue Jays are anywhere near as injury prone as they were last year, they’re going to need some reinforcements from the minors. Alford could fill that void, as he can play any of the three outfield positions, while hitting decently. 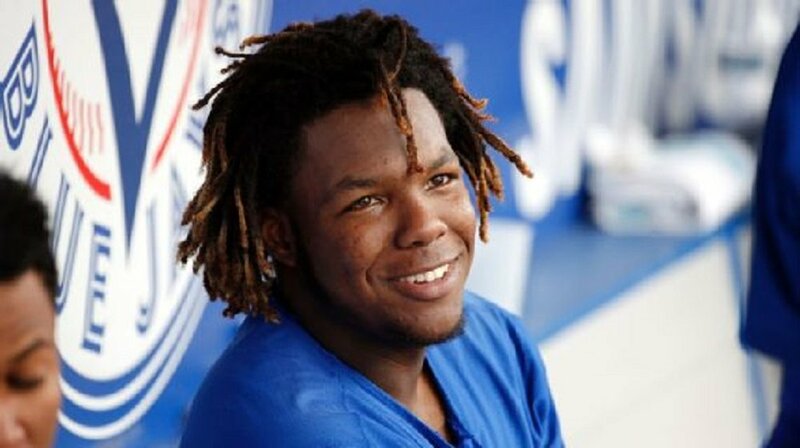 The reason I put him ahead of Bichette and Guerrero Jr. in terms of getting called up is that he’s simply older and more experienced. Alford is 23 and will turn 24 in July, and while the sample size is rather small, he did play in the major leagues briefly last year. He won’t have to go through the Major League Debut shenanigans if he gets called up during the 2018 season.. The main point of what I’m saying is that you should take everything that happened yesterday with a grain of salt. Yes, it was awesome to see our best prospects perform like our best prospects, but let’s not get on the “Call up Vladdy and Bo!! !” train just yet. They’re both so young, along with the fact that there are established players playing their positions on the big league club right now in Troy Tulowitzki (when he returns from the DL) and Josh Donaldson. So, there’s really no reason to rush them to the MLB just yet. They’ve got plenty of time to continue to grow, and if the Jays want to make their transition to the big leagues as seamless as possible, they’ll wait this one out and pick the best time to get these two studs playing for the Jays.